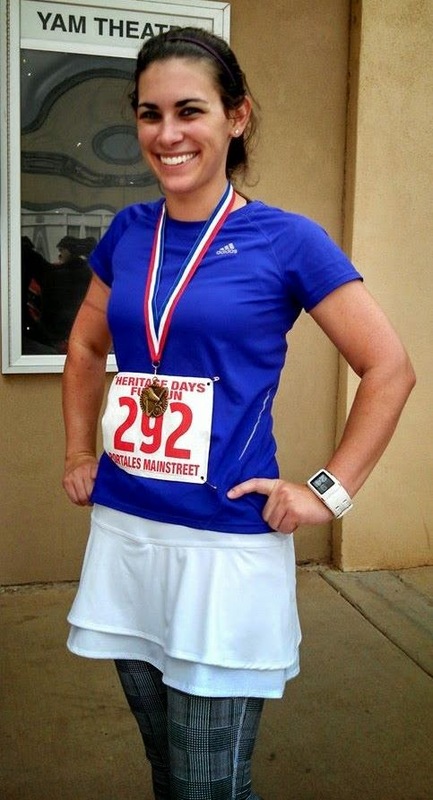 The Running Mormon: My First Gold Medal! I love it when I find a local race. 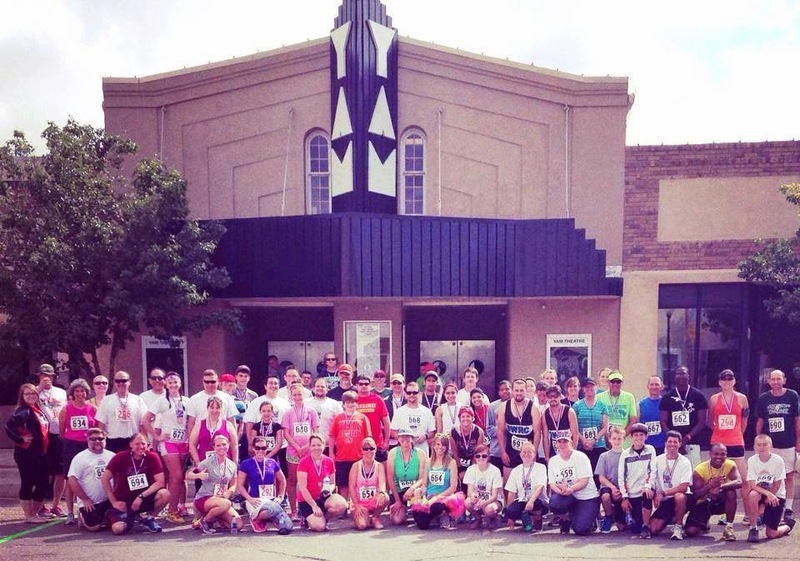 This area isn't particularly known for its running, so anytime a local race pops up, I have to register because I want to support the small-but-growing running community of Eastern New Mexico. So, when I found a 10K in the adjacent town, I immediately signed-up. Another plus: this took care of my medium-length training run for the week (I'm week 9 into my half marathon training plan). I love doing races for training runs as they cause me to push harder and faster than I normally would, as was proven during this race. 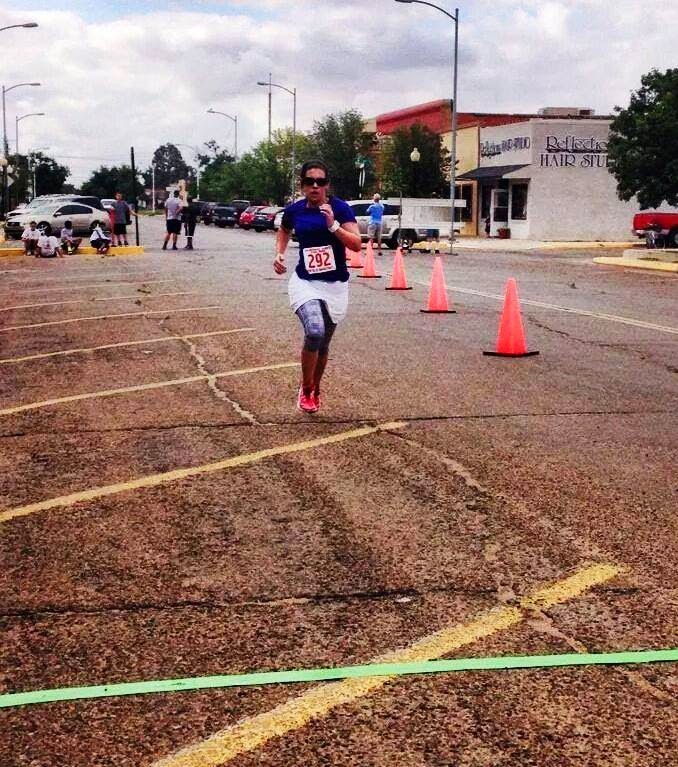 Though a small race, the Portales Main Street Heritage Fun Run 5K/10K was well organized with a wonderful group of volunteers! Aid stations were set up in prime locations, the course was easy to navigate, and the cheering section at the finish line was loud and supportive. The course was fast and flat, which is my favorite kind of course. The only thing I would change about this race was the 10K course as it was two loops of the 5K one. I'm not a fan of having to run the same route multiple times; it usually psyches me out. Other than that, everything was great. I even made a couple new friends along the run. A few people even recognized me from the Clovis News Journal article about my entry in the Women's Running Cover Model Contest. I've never kept such a fast pace in a 10K before! My former 10K personal record (PR) was 1:05:58, and that was pushing it hard for me. 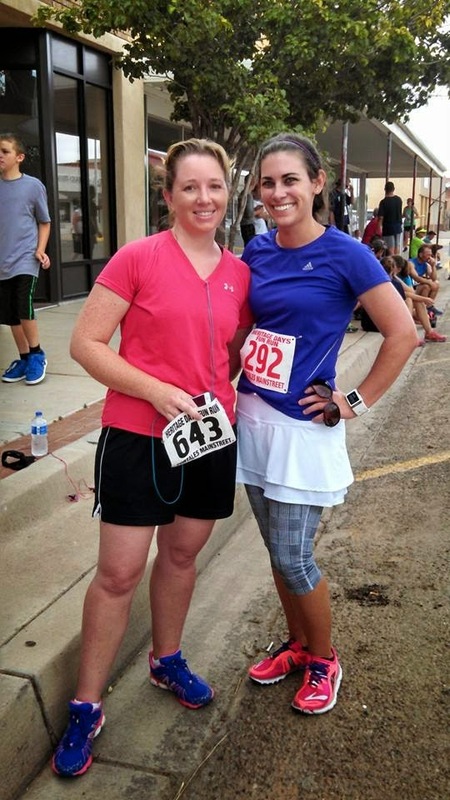 This race, I ran with a woman named Cassandra the first loop as she was doing the 5K. At the turn around for loop #2, I saw I was only following one other female runner and she was about 150 yards ahead of me. As we neared the next mile marker, a couple male runners heading the opposite direction shouted at me, "Go on and catch her!" I retorted, "Sure, I'm going to speed up the last mile." They just nodded their heads and laughed, "Sure." But, sure enough, I steadily gained ground on her until I passed her at mile 5. I knew I had to keep my momentum up, so even though I was already dying, I pushed my pace a little harder. As I rounded the last bend, I saw Cassandra waiting to finish the race with me! That was a great surprise and a wonderful motivator to keep me running. With the orange cones marking the finish in my sights, I was able to gather up enough energy to hold a sprint-kick the last quarter mile and victoriously cross the finish line. Then I promptly stopped, bent over, and tried to catch my breath. After about 10 minutes of walking around with my hands at my waist breathing heavily, I could finally speak again. 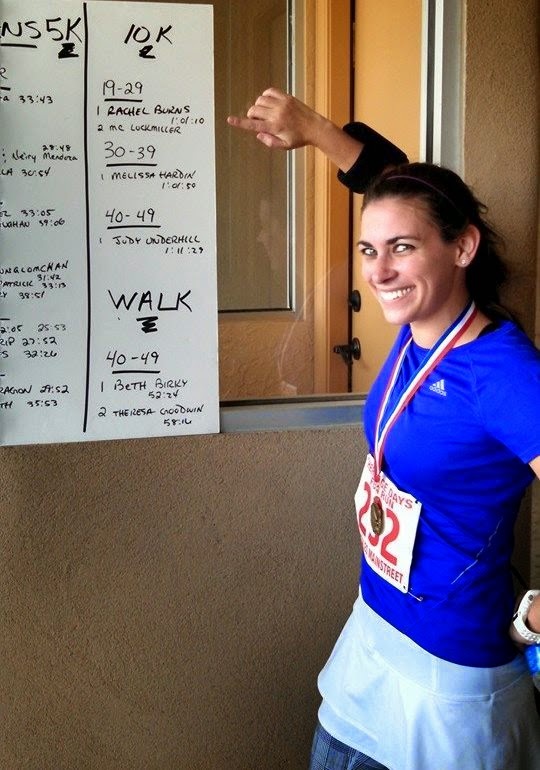 They posted the age-group winners and their times on some poster board. I found my name at the top with the finish time of 1:01:10! Not only did I beat my last PR, but I killed it by 4 whole minutes (a lot in running-time)! 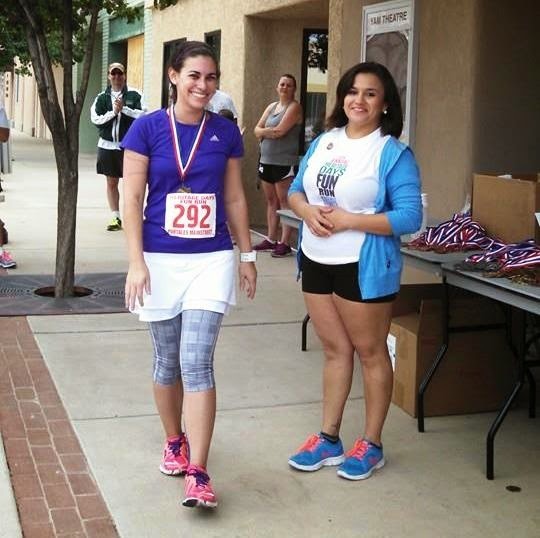 And, I had come in first of all the female 10K runners! I was elated! I have never placed in a race before, let alone won a race! I sported my gold medal the rest of the day. My usual post-race ritual is to shower, wear the race shirt, wear the race medal, and eat a hearty Mexican food meal. I accomplished each of those and added "eat a large serving of fro-yo." I felt like celebrating the whole day! 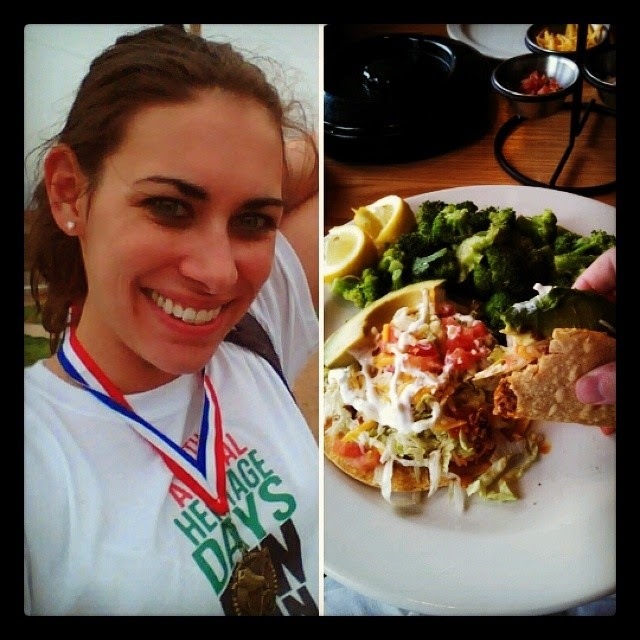 Post-Race Rituals: wear race shirt and medal, eat Mexican food. I'm hoping that this win is a sign of a future big win...winning the Cover Model Contest for Women's Running Magazine. Please continue to vote for me, Rachel B.! 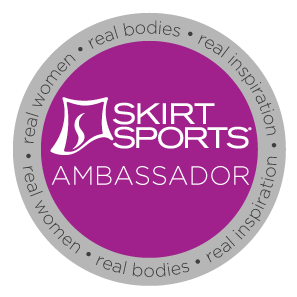 Just go to www.womensrunning.competitor.com/cover-model-contest and vote for me daily on every device until 12pm PST on July 2nd. Share and spread the word to have all your friends help me win this contest! I appreciate all the support I've received thus far, and your continued support in this.